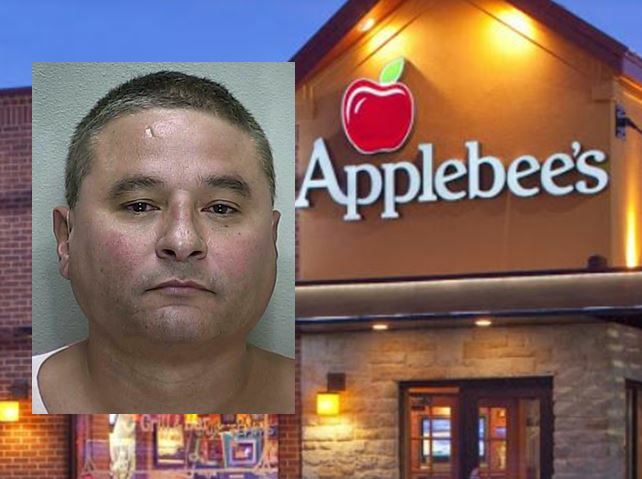 Ocala, Florida — An argument between a customer and a server over a wrongly prepared hamburger prompted Ocala police to respond to the Ocala Applebee’s. Ocala police said that the general manager of the business stated that an irate customer started the argument with a server over a hamburger. When Police arrived, they made contact with the customer, identified as Osvaldo Alfonso, 51. Police reported that Alfonso “immediately became irate” when asked about the argument that had taken place with the server. Police said that Alfonso began screaming profanities and refused to cooperate. During questioning, Alfonso approached one of the officers in an aggressive manner, grabbed her right arm, and pushed her. Alfonso then approached a patrol car and demanded that he be taken to jail. When police asked Alfonso to step away from the patrol car he began shouting obscenities. According to reports, Alfonso then approached the front of the business and began yelling at customers as they were exiting. When asked to calm down, Alfonso again approached the patrol car and struck the driver’s side door with his fist. Police then offered Alfonso a ride in the patrol car as they attempted to handcuff him. Alfonso changed his mind about the ride and resisted arrest. He was eventually handcuffed and transported to the Marion County Jail. He was charged with Battery on a Law Enforcement Officer, Resisting Arrest, and Disorderly Conduct. Police said that Alfonso was intoxicated. The hamburger was apparently missing the lettuce, tomato, onion, and pickle and had actually been ordered by Alfonso’s friend.